Since the day back in 1981, when Inquiry Magazine dispatched me to the mountains of Cherokee County to find out why a popular defoliant was causing so much trouble in the forests and small towns of western North Carolina, I’ve been an environmental reporter. 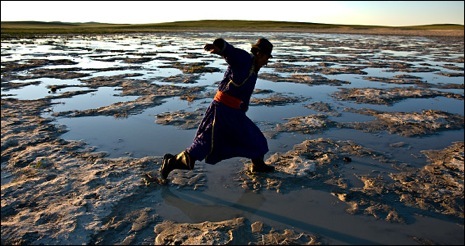 Today, Circle of Blue, where I serve as a senior editor and producer, posted “Reign of Sand,” an online multi-media report on the transition from grass to dust that is occurring in Inner Mongolia. Take a look. “Reign of Sand” represents the leading edge of global environmental journalism. It’s not only that the package joins traditional narrative reporting with superb multi-media story telling. It’s also that this ambitious journalism was produced by an independent news organization based in Traverse City, Michigan. As environmental reporting and most other important journalism is gradually pushed out of the newspapers and television reports of America’s mainstream news business, it is flourishing in independent news organizations, among them Circle of Blue. “Reign of Sand” achieves the highest standards of probing original reporting and exceptional multi-media presentation. Frankly the reporting is as solid as anything produced by the New York Times, the pictures achieve the same striking quality as National Geographic, and the interactive map and video are simply superb. For this old salt, the posting of “Reign of Sand” is an exciting moment in a long and productive career in writing about the competition between man and nature. Over the years I’ve reported and published in the New York Times, Boston Globe, Chicago Tribune, Baltimore Sun, Philadelphia Inquirer, Sacramento Bee, International Herald Tribune, 60 Minutes, NPR, Esquire, and Outside. And I’ve reported for those out of the mainstream — In These Times, Sierra, Amicus Journal, E Magazine, Mother Jones, Oceans, Grist. During all that time I made it a practice to keep my feet firmly set in both camps, and to keep pace with new technology and dissemination practices. In the late 1970s and early 1980s I wore out a Smith Corona electric typewriter just in time to buy one of the first IBM PCs in 1983, a system with a Volkswriter word processing program and a Xerox daisy wheel printer that set me back $6,000. I borrowed two-thirds of it from my Dad. At that time I founded and edited two independent news services — SC Featured in Charleston, S.C., and NewsWest in Sacramento. I syndicated articles in national publications, along with black and white pictures. I sent my work in big yellow envelopes through the mail. When I wrote for the Times as a stringer, I read the copy into a recording machine in New York. When I joined the Times in 1985 we used Radio Shack TRS 80 computers that showed three lines of type in a narrow window. The machine came with two black rubber cups, which you had to squeeze onto either end of a telephone receiver. Sending a file involved finding a pay phone with a good signal, dialing up New York’s computer, waiting for the high-pitched computer squeal, punching a key or two on the Trash 80, and hoping the connection would hold long enough to send the whole file. Often it didn’t. But it was easier than reading into a recording machine. By the time the Web made its presence felt in the mid-1990s I’d jumped out of the mainstream and into the new media of the Michigan Land Use Institute, managing a team of journalists who broke stories and framed the environmental story in this state not as a litany of toxic assaults but as a story of opportunity and economic competitiveness. The Institute gradually discarded much of its expensive print reporting and posted most of its work on our own online news services, email alerts programs, and a Web site that eventually attracted nearly 200,000 visitors a month. Circle of Blue advances and improves that model, applying great reporting and multi-media story telling to global environmental issues, and doing it in a way that is both fresh and absorbing. The reporting was undertaken by a writer based in South Korea, a photographer from Malaysia, and a videographer and editor from Traverse City. The story the Circle of Blue team brought back from Inner Mongolia has global significance. The tools the organization used to produce and disseminate it sets a new standard for environmental reporting. For a writer who once earned his keep with an electric typewriter and postage stamps it’s both amazing and a ton of fun.